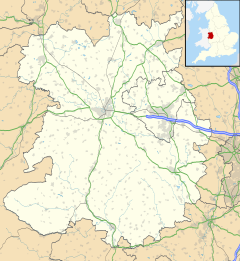 Montford Bridge is a village in Shropshire, England, and also the name of the bridge in that village. It lies on the River Severn and is close to the town of Shrewsbury. Most of the village is in the Montford parish, but some is covered by the Bicton parish. The A5 road used to run through the village (over the Montford Bridge), but has been diverted via the Shrewsbury bypass. There are still some services, such as a shop (closed as of 2011) and a pub (the Wingfield Arms), in the village. The bridge was Thomas Telford's first bridge design. It was built by John Carline Jr and John Tilley between 1790 and 1792. It has three masonry elliptical arch spans, two of 55 ft, and the central one of 58 ft. It was widened in 1963 by adding a reinforced concrete slab. The bridge is now a Grade II listed building. ^ Telford, T. (1838). The Life of Telford. p. 28. Wikimedia Commons has media related to Montford Bridge. This Shropshire location article is a stub. You can help Wikipedia by expanding it. This article about a bridge in the United Kingdom is a stub. You can help Wikipedia by expanding it. This page was last edited on 8 September 2018, at 18:05 (UTC).